Seeing as the forums have a sotd thread, I thought it would be a good idea to have an incense of the day thread on here. Rather than a new thread every day, just keep adding to this one. Today I have been burning Shoyeido's Baika-ju. Nice and smooth smelling with a creaminess kind of smell. 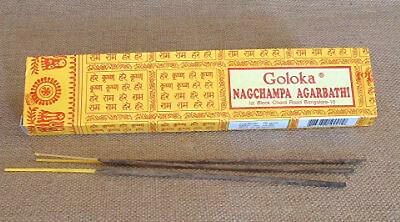 A good quality incense for a bargain price. Today, it's Baieido's Syukohkoku. Love this one. I've never tried the Tokusen version, although I'm not sure if Nakata-san from Baieido may haave sent me a couple of sticks years ago. Today, it's the very basic Nippon Kodo's Shinsei Eiju..peppery wood scent. whoops.. did i forget to include a sample in my package to you the last time? I have noticed something about a couple of sticks you sent. The Medicine Buddha from Nara smells like Shoyeido's En Mei and Sanjusangen-do could possibly be Baieido's Kaiunkoh. I will send u a private message. Burning one of Baieido's Ensei Aloeswoods, not sure which one, it's in a small vial that Nakata-san from Baieido once sent me. So you managed to get the Sanjusangen-do senko then Orgoglio? My incense of the day was Shoyeido's Myoho. I bought a sample pack of 8 sticks of it a month or so ago, since it was noted by members of this board as a favorite. I didn't like it at first myself, though; it had what seemed to me a strange combination of very sweet and very bitter aromas, and where they intersected seemed to clash with my senses. I'm more used to it now, though, and i can approach its contrasts with greater equanimity and enjoyment.